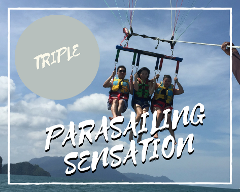 Our high tech, custom built Parasailing vessels, water sports lovers can finally experience the heart-thumping thrills of Parasailing with unparalleled safety standards and comfort for the whole family. 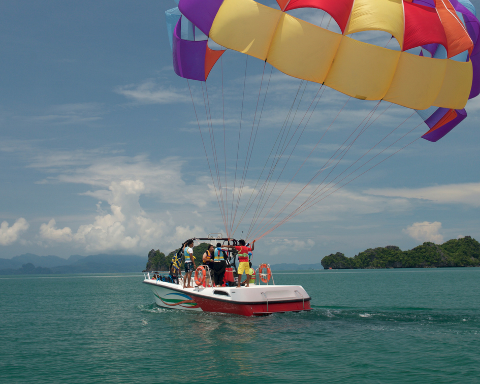 Now you can view the awesome seascapes around Langkawi archipelago while floating 500 feet above the water with total peace of mind, knowing that you will be landing with complete safety. Accompanied by a certified captain and crew members. Life Jackets are provided for your safety and comfort. Free access to Paradise 101 facilities. 1. 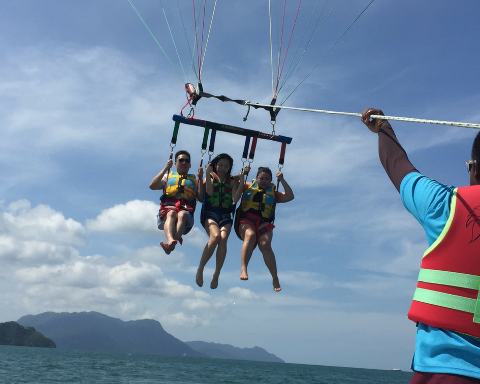 Any weight requirements for parasailing ? – A minimum of 50 kg for Single flyer and maximum of 250kg for Triple Flyer. – If a flyer is lighter than 50kg then they must fly as a double or triple. 2. 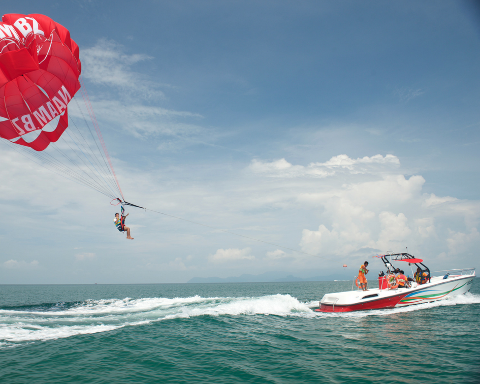 Is your parasailing from the beach or from the boat ? 1. The parasail winch boat is able manoeuvre into any wind direction, this is important for two reasons. 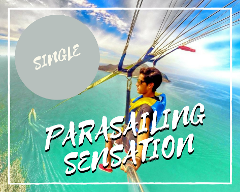 Firstly, for take-off and landing, by being able to fly straight into the wind keeps the parasail straight which stops the parasail veering of violently to find the wind, which is what can happen from the beach take-off. 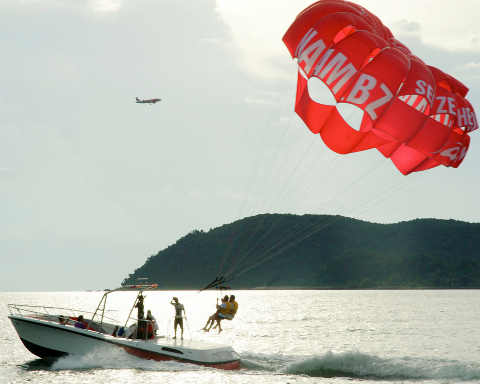 When take-off is done from the beach and the wind direction is not ideal the parasail and passenger can veer off course, possibly sending the parasail into objects or bystanders. Secondly it allows the take-off and landing to be made at the slowest speed possible, this gives a much more controlled landing and therefore reduces the opportunity for any injury unlike from the beach where uncontrolled hard landings are common. 2. 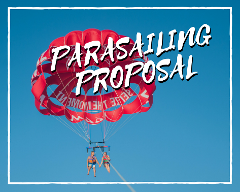 Should the wind increase unexpectedly while flying, the parasail winch boat is able to manoeuvre accordingly and winch the passengers down to the boat. 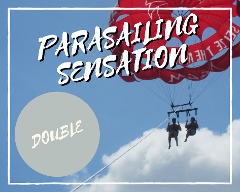 Parasailing from the beach relies on the wind conditions to be correct in order to get the boat, parasail and flayers back to the landing area. Changing wind conditions have caused passengers to be stuck in the air for hours or even have the towboat pulled on to the beach with passengers hitting buildings etc. 3. 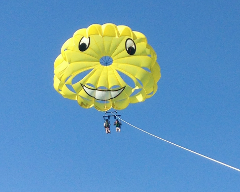 Can we do parasailing together ? We do offer Single Flyer, Double Flyer and Triple Flyer options.